Though not listed in the world’s top 10 smartphone brands, Tecno has made outstanding achievements, securing the second place in the African smartphone market in 2016, according to Taipei-based research institute MIC (Market Intelligence & Consulting Institute). "Founded in 2006, Tecno entered the African market in 2008 with its first feature phone T570. 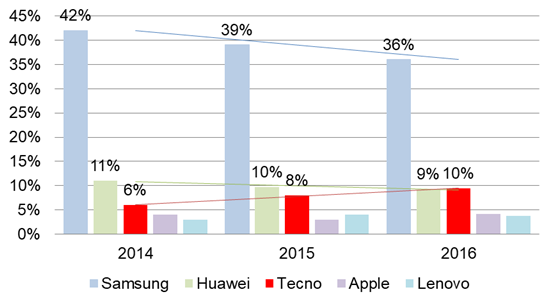 In 2016, Tecno was the largest mobile phone brand in Tanzania and Nigeria with a market share of 41% and 31% respectively," says Shih-Zong Huang, industry analyst with MIC.